I’d like to introduce you to Pinky and Spruce! Pinky was heading off on vacation, and somehow lost his way…Luckily, he met Spruce, who can show him around this NOT tropical climate he has landed in! They have so much fun together, and have become the best of buddies <3 Their only argument is whether to have a snowball fight, or decorate Spruce! They would love to come to your house to play! 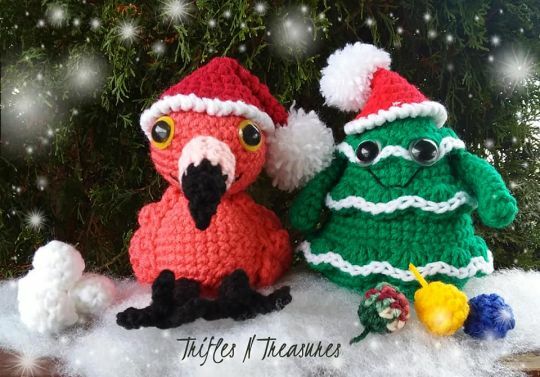 Pattern includes both buddies, both hats, and their snowballs and ornaments…Both buddies measure 5" tall, and use less than 1/2 a skein of yarn to complete.